When choosing a material for a house sign, most homeowners instinctively reach out for the one that looks the best against the backdrop of the house. It’s not surprising- after all, the overall look is undeniably a major factor to be considered when choosing a house sign. However, it is by no means the only factor. Different materials have their own set of advantages and disadvantages and in choosing, you have to consider which best suits your particular set of circumstances. Slate : Slate is the most commonly used material for house signs and for good reason– it is functional as well as beautiful. Slate is weatherproof, long lasting and affordable and creates a lovely contrast with the brick and stone colour of most homes. Stone : When it comes to durability, nothing can beat stone. Some types of stone can last for several decades without looking old or dirty. 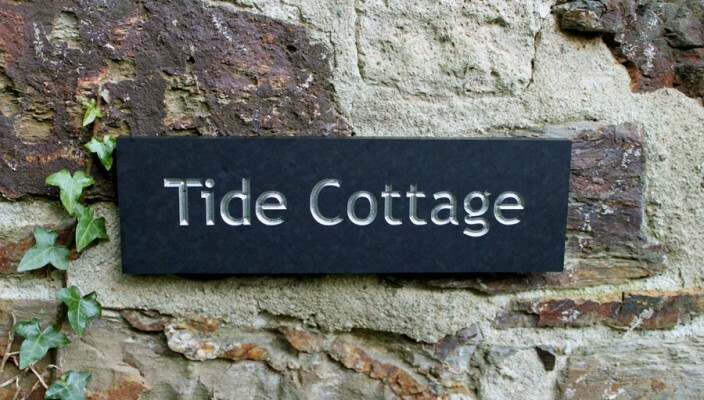 Instead natural stone house signs age gracefully and develop a distinctive character of their own. Marble and granite are two of the most popular choices in stone for a house sign because their sleek, sophisticated looks. The only limitation to using stone is that it cannot accommodate elaborately curved script. This means that details displayed (house number, house name etc) are often difficult to engrave. Wood : Usually made of cherry, oak and red cedar, wood house signs add a touch of elegance and style to any home. Wood is a versatile material in that it can be carved to any shape, polished to several different shades or painted to any colour. Wood house signs last for years and will stay looking good with regular paint or varnish touch ups. Cast Metal : Cast metal signs, which are typically made of aluminium, brass or iron also look good and are very versatile. One of the reasons why they are so popular is that cast metal can be shaped into any design of your choice. If you are looking for a custom shaped house sign, cast metal is the material to go with. Acrylic : One of the newer materials available, acrylic is light and inexpensive and a good choice if you are aiming for a more modern look with your house sign. They do not last as long as most other materials but its low price point makes it a great choice if you like changing your exterior decor as often as you change your interiors. High Density Urethane : High Density Urethane material, which looks like wood but is more durable and requires less maintenance, is fast gaining popularity with homeowners who love the look of wood but prefer to use something that will last longer with less effort. When choosing a material for your house sign, there is no one trait that is more important than the others. Looks, maintenance and durability are all equally important and in looking for the right material, you will have to take all three factors into consideration.